Jallikattu, or Eruthazhuvuthal, the traditional bull taming event, dates back to the Tamil Classic period (400-100 CE). Jallikattu is an annual event where men try to tame and hug the bull and has been a part of the traditional celebrations of the four-day Tamil Nadu harvest festival, Pongal. The word Jallikattu has two components, Jalli also known as salli or kasu, which translates into coins, and kattu which means bundle or pouch. This is a reference to a yellow pouch of coins, which is tied to the bull’s horns. The sport is also called as Eruthazhuvuthal, which means ‘hugging the bull’. The sport, which is played on the third day of Pongal (Maattu Pongal), has a natively reared bull being left free in an arena. Groups of people enter this arena and try to tame the bull with their bare hands. The participants try to do this by holding the bull by its tail and horns. The bulls are specially prepared for this event by various farmers. Various measures are taken to make the bull strong and healthy. Bulls are bred specifically for the event. The calves chosen to become Jallikattu bulls are fed a nutritious diet so that they develop into strong, sturdy animals. The bulls are made to swim for exercise. 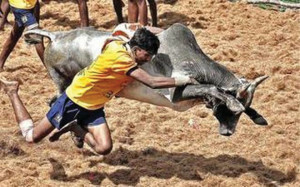 The calves, once they reach adolescence, are taken to small Jallikattu events to familiarise them with the atmosphere. Specific training is given to vadam manju virattu bulls to understand the restraints of the rope. Apart from this, no other training is provided to Jallikattu bulls. Once the bulls are released, then instinct takes over. This version takes place mostly in the districts of Madurai, Pudukottai, Theni, Thanjavur and Salem and has been popularised by television and movies. It involves the bull being released from an enclosure with an opening. As the bull comes out of the enclosure, one person clings to the hump of the bull. The bull in its attempt to shake him off will bolt (in most cases), but some will hook the man with their horns and throw him off. The rules specify that the person has to hold on to the running bull for a predetermined distance to win a prize. In this version, only one person is supposed to attempt catching the bull. But this rule being strictly enforced depends on the village where the event is conducted and, more importantly, the bull itself. Some bulls acquire a reputation that alone is enough for them to be given an unhindered passage out of the enclosure and arena. This version is more popular in the districts of Sivagangai, Manamadurai, and Madurai. The bulls are released into open ground without any restrictions (no rope or determined path). The bulls once released run in any direction. Most don’t even come close to any human. But there are a few bulls that don’t run but stand their ground and attack anyone who tries to come near them. These bulls will “play” for some time, providing a spectacle for viewers, players and owners alike. The magnificence of such bulls cannot be described.